Exclusive members will get to see Medusa feeding, swimming, playing, slithering, attending special events, and even side-winding through the parks of Kansas City! When you subscribe to an upcoming PPV event, you will also have access to all private archived video clips, access to discount coupons to Edge of Hell Haunted House, and much more. 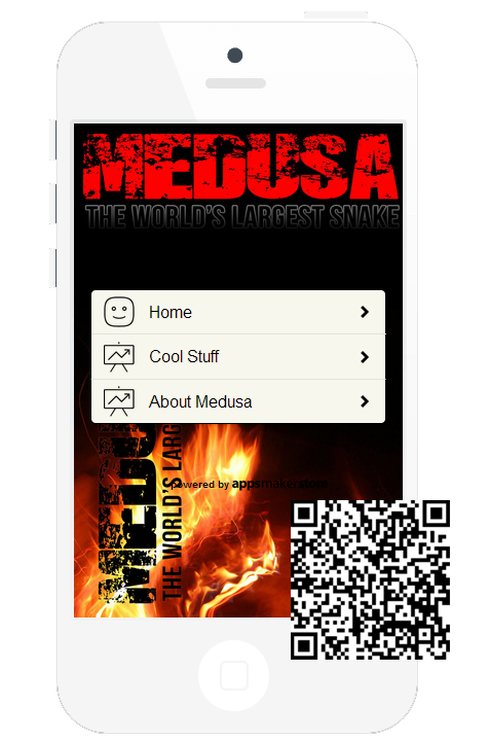 The new" MedusApp" provides the opportunity for viewers to have a totally mobile enriched experience with Medusa's original archived and "live" content. It serves as an “on-the-go” version of the website with enhanced photos, graphics, and other cool stuff without having to be tied to your PC. Simply scan the QR code above with your mobile device to load our new HTML5 version of the MedusApp!